In Octave's own code base we only use two spaces. 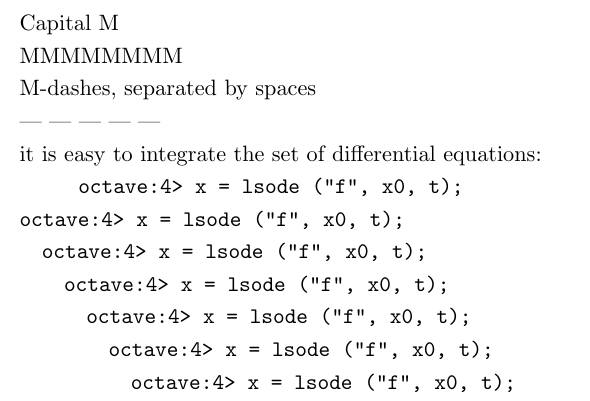 Theoretically this is controllable by issuing an @exampleindent N command at the beginning of the Octave documentation, but I have not gotten it to work. Maybe we need a Texinfo wizard to help us set that up. I see some changes in the PDF output when using different values of N for "@exampleindent N", but the spacing seems wider than the documented N ems. Nothing seems to change for Info output. This looks like a bug in texinfo to me. I did some experimentation. The spacing used in the PDF is measured in ems, a typographical unit that used to be the width of a capital 'M', but is now the width of an em-dash by definition. While the default value of @exampleindent is 5, in TeX this is rendered as 0.4 inches. However, if you specify the value as 5 then TeX renders 5 em-dashes which is actually larger than 0.4". In the figure below, the first indent is "asis" which is 0.4". Then there is a cascade of 0, 1, 2, 3, 4, 5. I propose setting the example indent to 2. The value of 3 produces an indent which is already larger than the default which itself I consider too big. Unfortunately, fractional values are not allowed. We could also consider changing @paragraphindent for improved readability.